9 3/10 x 68 1/10 in. 180 x 160 cm; 70 9/10 x 63 in. 69 x 72 cm; 27 1/5 x 28 1/3 in. Words Tend to be Inadequate is a group exhibition that illuminates how the use of text in the visual arts can be as powerful as images in communicating ideas or expressing inner feelings, thus exposing a personal world or responding to the world that surrounds us. 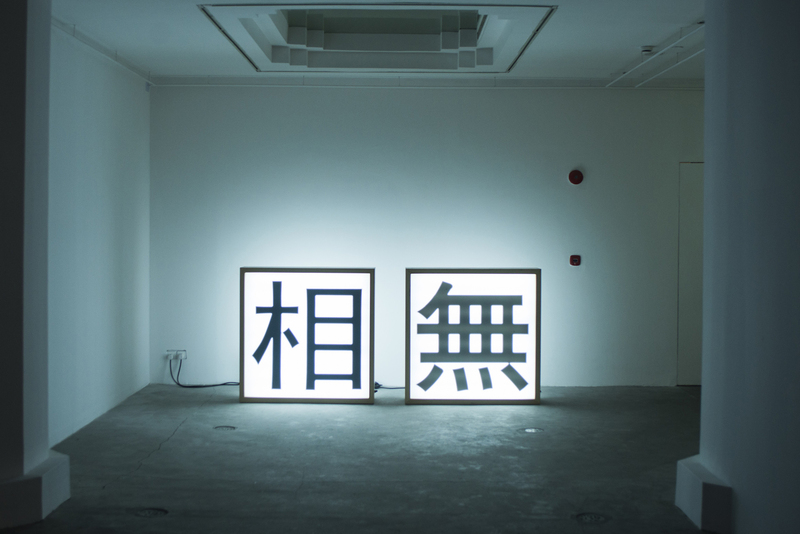 The show aims to stage a meaningful dialogue between eight contemporary artists from the East and West who use words visually in their work, which include painting, collage, photography, LED signs, installation, and film. 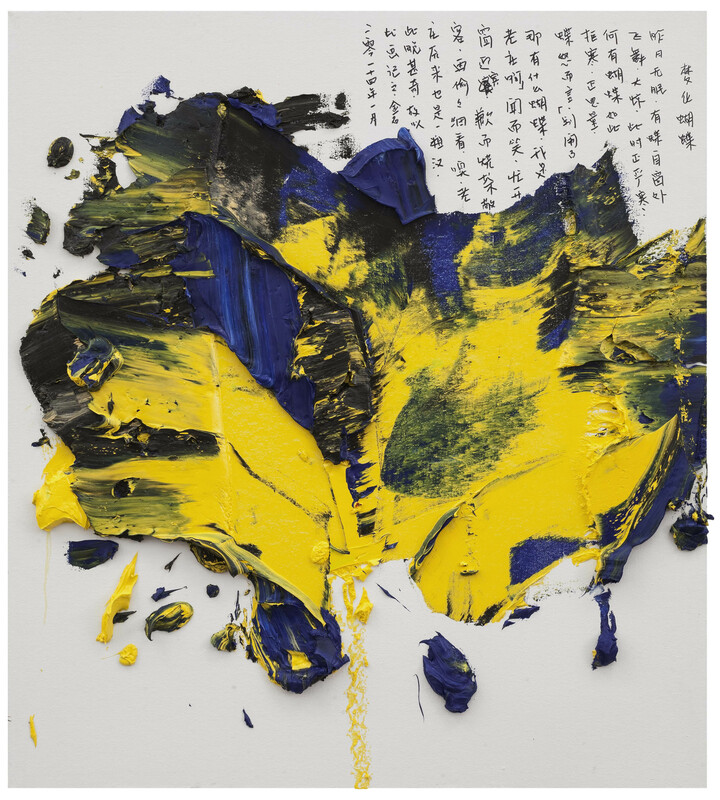 Works by Daniel Gustav Cramer, Gonkar Gyatso, Jenny Holzer, Qin Yufen, Qiu Zhenzhong, Tsang Kin-Wah, Wang Qingsong, and Zhu Jinshi explore different uses of text in art. The exhibition title “Words Tend to be Inadequate” is an aphorism from Jenny Holzer’s text series Truisms. If “words tend to be inadequate” on their own, then these artists aim to go beyond a word’s surface through their work to delve into deeper meaning. Text or words have a long history in both the East and the West, although each has its own distinct trajectory. Ancient China was a culture devoted to the power of the word. Chinese emperors would have their pronouncements engraved on mountainsides and outdoor stone steles as a means of asserting their authority in the present and for posterity. The importance of the word is reflected in the elevated status of calligraphy, which was revered as a fine art long before painting, and was prized above all other visual art forms. Meanwhile, in Ancient Greece text could be found in the public sphere on objects such as statues, funerary steles, pottery, or on civic notices such as those inscribed on the ostrakon (a fragment of a pot) which announced the name of those ostracised (banished) from the city. In Christian tradition, word features prominently as a sign of power. The first verse in the Gospel of John reads, “In the beginning was the Word, and the Word was with God, and God was the Word” (John 1:1). The Word is used as a symbol of authority, a philosophical idea, which is interpreted as referring to Jesus. Text continued to feature prominently in Byzantine icons and on medieval illuminated manuscripts that combined images with words. In modern times, text saturates human consciousness on various platforms globally, and its relationship to art has expanded the field of visual culture. Artists make use of the medium in a multitude of ways, pushing the boundaries of what is understood as visual art. In the East, the use of text continues as a long uninterrupted tradition with Chinese artists carrying on the traditions of Chinese literati art. Their work often features calligraphy, which despite being a form of traditional art, shares similar characteristics with contemporary text. 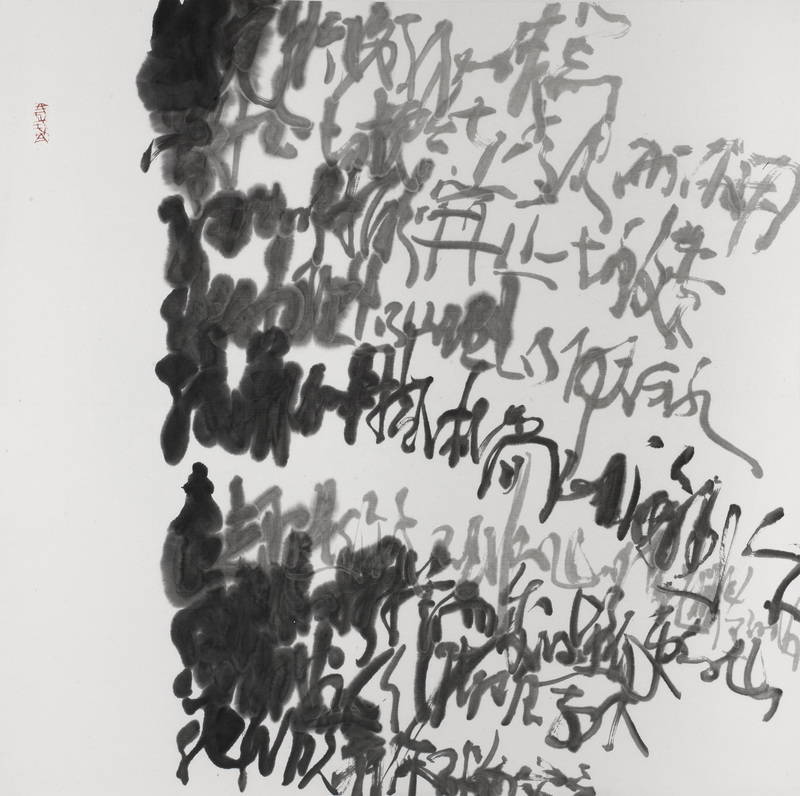 One distinctive characteristic of contemporary Chinese artist-calligraphers is that they continue to emphasise the inherent nature of selfhood through their reinvention of language within visual art. On the other hand, in the West the use of text as an artistic tool in the 20th century was a defining moment for the visual arts that has had a lasting impact. In the first part of the century, El Lissitzky’s and Kurt Schwitters’ early experimentations of combining text, lettering, and images served as a preamble to using text as a medium with meaning, image and anti-image. During this period there was also widespread use of signage and printed words in the urban landscape as a result of advertising and marketing. This was a practice that had precedents in varying forms, but had now acquired a formal structure and purpose. During the 1960s there was a proliferation of the use of language in the work of conceptual artists like the group Art & Language, Joseph Kosuth, Lawrence Weiner, and John Baldessari. Their work emphasised the use of language, where words played a primary role and emphasis was on ideas over visual forms, something which has often been attributed to Marcel Duchamp as “the dematerialisation of the art object”. In the 1970s and 1980s a new generation of artists, including Jenny Holzer, Louise Lawler, and Barbara Kruger, appropriated the medium and expanded its possibilities as an effective socio-political artistic intervention. Jenny Holzer is one of the most respected contemporary artists of her generation, best known for her large-scale public projections of text. Her witty and provocative slogans borrow the format of advertisements and are often presented in the public sphere in the form of LED displays or large projections on public buildings. The main focus of her work is the use of words and ideas presented in the most accessible way. Holzer’s work also includes these phrases carved in stone on public benches, which are somewhat reminiscent of the tactics of Chinese emperors. However, her intention is not to preserve them for posterity; rather, she hopes to use the power of words to relay messages to a wider audience. 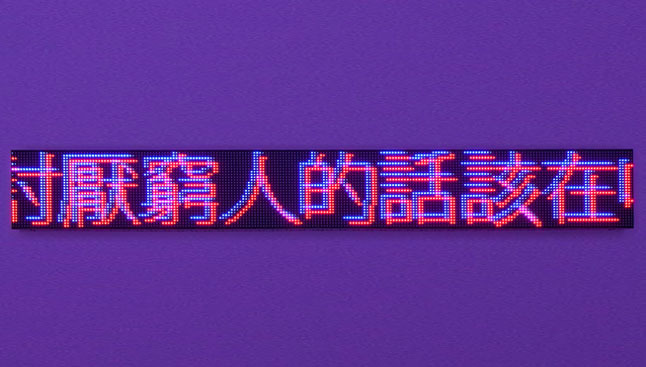 The exhibition features Holzer’s LED signs Pearl’s Truisms and Survival (2013) with a selection of phrases from two of the artist’s earlier series translated for the first time in Chinese. Truisms was Holzer’s first body of work that used text at the beginning of her career in the 1970s, which appeared as posters anonymously posted on buildings around New York. It consists of a series of declarations written by Holzer and are phrased to resemble existing aphorisms. Survival is the first text series conceived specifically for electronic signs, borrowing the format of signs in New York’s Times Square. The tone of the writing has an urgency about it and consists of sentences that give instructions or information, or pose questions. Hong Kong-based artist Tsang Kin-Wah typically deconstructs the dominance of Western ideologies in his works. He is known for his text installations, such as his homage to Jenny Holzer, Jenny just turns her back on me when I’m lost in… Art Basel Hong Kong Kabul Nicosia Phnom Penh Ulan Bator?? (2013), which consists of laminated glass with vinyl text running out of it onto a floor space of 10 x 10 metres. Tsang swirls crude phrases like “LUXURY ART CREATE$ BIG MONEY” and “ABU$E OF ART COME$ A$ NO SURPRISE” into visually dynamic patterns on the surface, although the fundamental core of the work is in the words’ emotional impact. 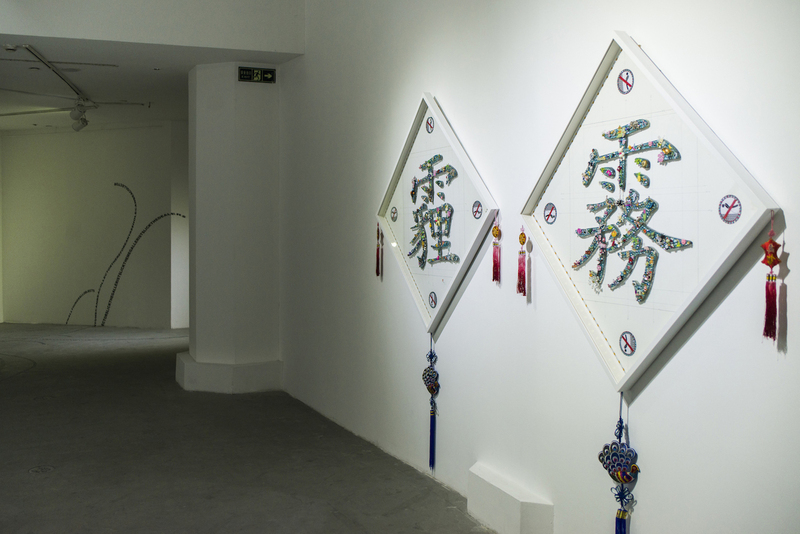 Beijing-based artist Qin Yufen also uses text in her installations, which typically combine traditional Chinese materials like silk with sound and text. There is a poetic quality to her works, as, like many Chinese artists who root their practice in Taoist principles, she believes that the inner expression of an artwork is more important than its visual appearance. With a background in Chinese painting based on calligraphic brushwork, Qin began experimenting with text soon after her arrival in Berlin from Beijing in the mid-1980s. Since then, she has consistently used text in her sound installations. For this exhibition, Qin has reworked her piece shown at the 2006 Sydney Biennale on a smaller scale. 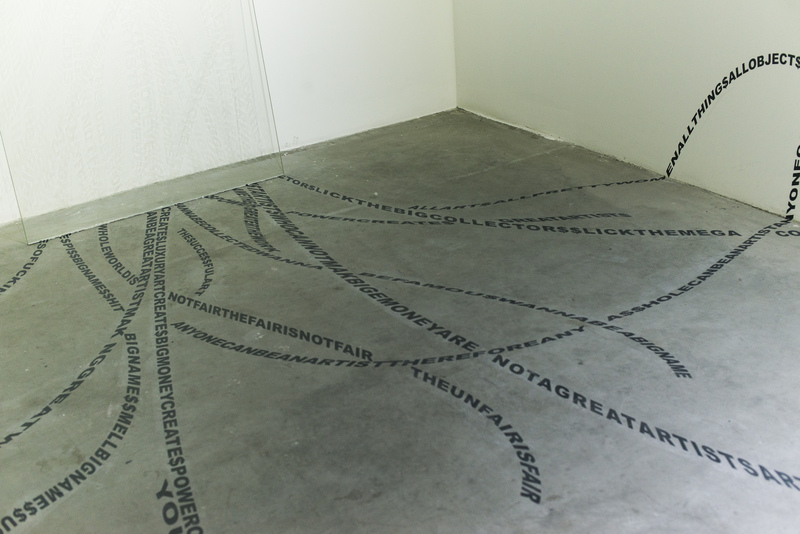 The site-specific installation, Untitled, features text, much like the aphorisms in Jenny Holzer’s works, which questions the role of art in society. The text is embroidered on 200 metres of silk, which will be draped across two drying racks. Tibetan artist Gonkar Gyatso and Chinese artist Wang Qingsong both address the effects of globalisation and rapid modernisation through their work. 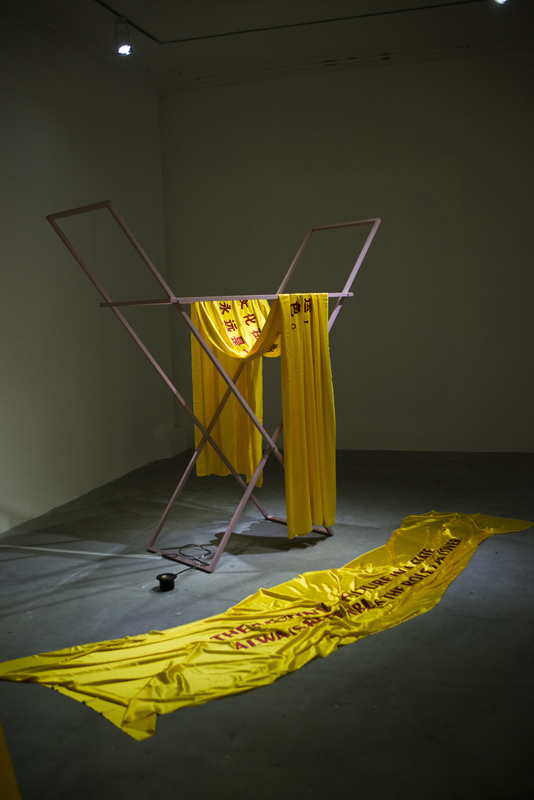 Tibetan-born British artist Gonkar Gyatso throws into question what is considered traditional, while addressing the many new cultural hybrid identities to which globalisation has given rise. This exhibition features three works from his 2014 text-based mixed media collage series, which depict phrases and words common in popular culture generated out of social or political need. In Wu Mai and Chai, the Chinese characters for smog and demolition are ironically embellished with sparkly kitten, butterfly, and flower ornaments. 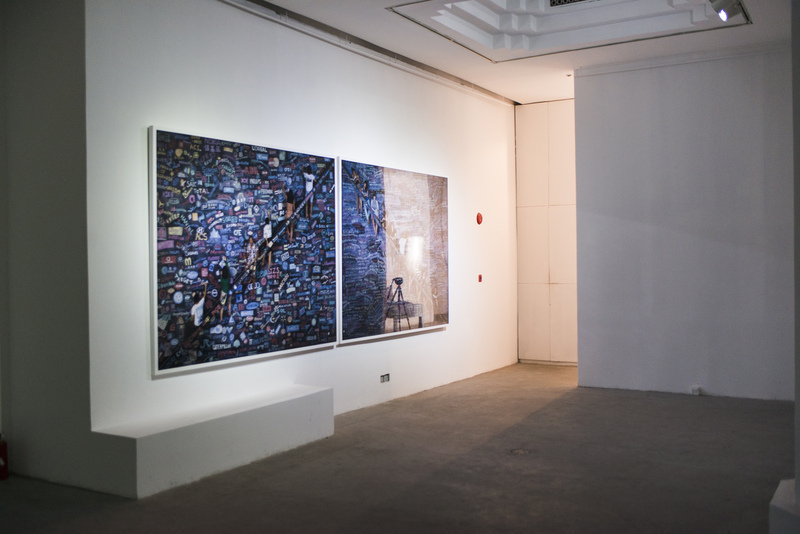 Acclaimed contemporary artist Wang Qingsong’s diptych One World, One Dream (2014) consists of his elaborately staged photographs named after the historic 2008 Beijing Summer Olympic Games slogan. The post-Olympics era has seen China rapidly develop in all aspects—politically, economically, and culturally. Wang’s One World, One Dream features the colourful logos of Fortune 500 companies drawn on a giant blackboard on one panel, and the names of top universities from around the world on the other. Wang questions the actuality of “one world, one dream”, which overlooks individual desires in favour of global corporatisation. 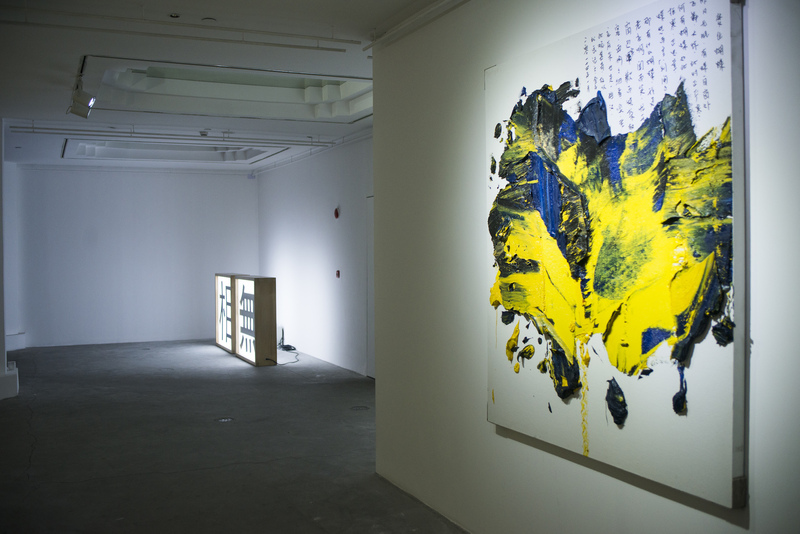 Chinese artists Qiu Zhenzhong and Zhu Jinshi all make references to traditional Chinese uses of text in art. For them, writing is part of their artistic process, which is just as important as the end result. Qiu Zhenzhong engages in the reinvention of traditional calligraphy and the written Chinese character through his work. 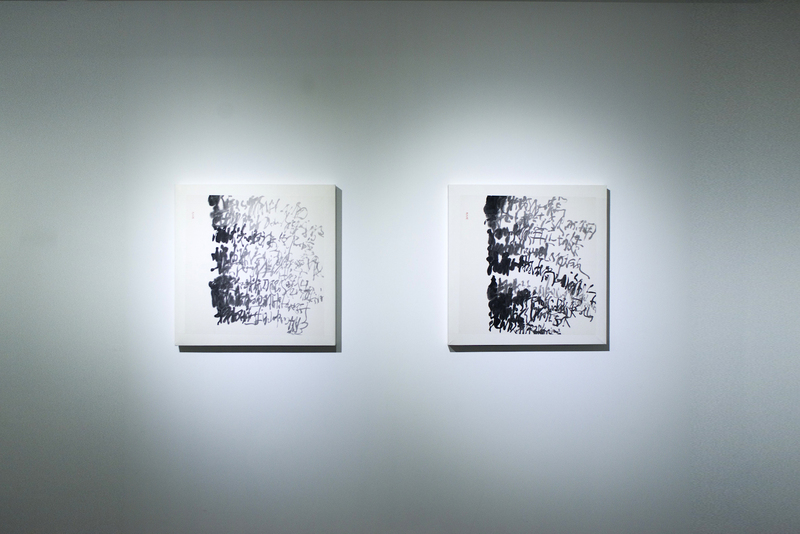 Here, he exhibits works New Poetry Series: Status -V (2005) and Feeling is a Fragile Container (2005). Despite his creativeness, the essence of his art is in line with the rich traditions of Chinese art. Traditionally, literati artists were well versed in “The Four Arts of the Chinese Scholar”, namely zither (a Chinese stringed instrument), Go (a Chinese strategy board game similar to chess), calligraphy, and painting. Artistic creation was often seen as a means of broadening one’s moral, mental, and spiritual cultivation. While the experimentation in Qiu’s work is significant, one can also see formal and compositional elements, such as lines and curves that co-exist with the underlying ideas of Taoism and spirituality. Since his return to China in 2000 after living in Germany for over a decade, Zhu Jinshi began to paint again, having previously focused on installation art. He developed a custom of writing words on the back of his paintings, which reflect his state of mind. He says the process helps him to clear his head. 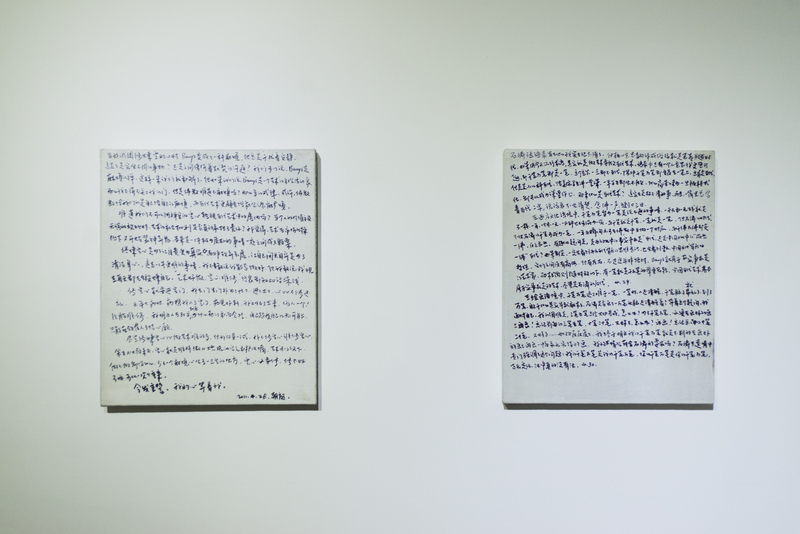 Diary 1 and Diary 2 (2011) contain scribbles from the artist’s diary on all sides of the canvas, while Turning into a Butterfly in a Dream (2014) features text that documents Zhu’s sleepless night the day before he created the work next to a painted image. It is similar to how poetry was written on ancient Chinese paintings to help viewers better understand the paintings’ contents. 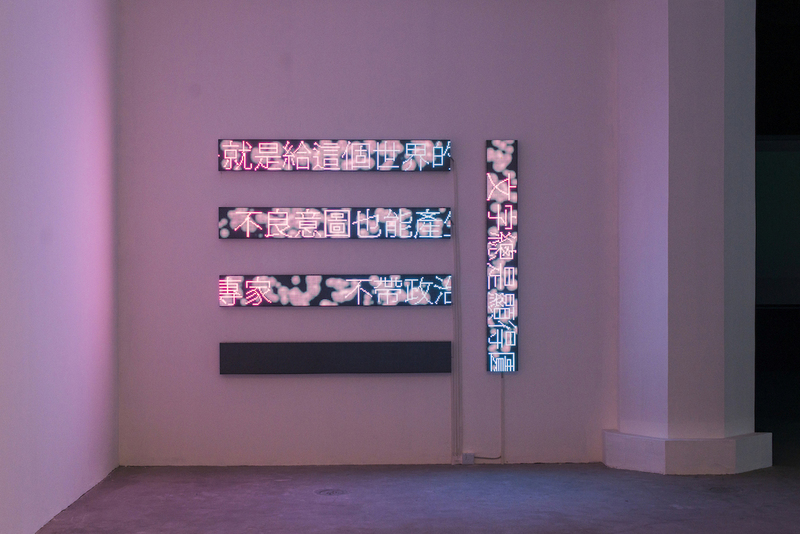 In this exhibition, Zhu debuts Formless, a new work that consists of light boxes painted with Chinese characters. The piece is inspired by the Diamond Sutra, and demonstrates the artist’s aim of reflecting Oriental philosophy in the simplest way possible. He showcased a similar work using letters of the alphabet at an exhibition in Germany in 1999. Daniel Gustav Cramer belongs to a younger generation of artists who use text. His work includes a wide range of media, from photographs to paper works, from texts to sculptures. With the use of text at the core of his investigations, Cramer transports the viewer into a personal, poetic universe revolving around the nature of memory. The artist “writes” in space in a sort of elliptic sequence, in which fragmentation and allusiveness stimulate the imagination and give rise to different narratives. The artist’s 20-minute video projection Orrery (2012) visually recounts an encounter between two men at night in a hut outside an Australian village. It records the time they shared, talking, being silent, and finally departing. The film is made up of three elements—word, sound and image. Words are at the centre of this, as they take the form of written text on the screen, expressing the thoughts and feelings of the two men without attempting to interpret them. The sound records the night outside the hut, while the images only portray the setting of the encounter, never revealing the two men. The film reflects on solitude, friendship, trust, and the fleetingness of time. While working across a wide spectrum of disciplines, all eight exhibiting artists use words for both their visual and emotional impact. As seen throughout history, text in art can make social, political, or cultural statements more powerful by drawing in audiences with their initially familiar nature, which upon closer inspection can reveal deeper significances and sensations. Additionally, words can reveal the inner workings of an artist’s mind or soul through their writing process or actual content. They can also simply serve as tools of communication in setting a mood or relaying information. However they are used, words serve a key purpose in our daily lives, which is reflected in the visual arts.